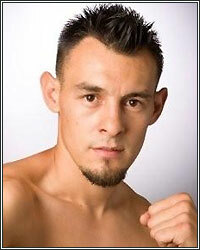 ROBERT GUERRERO: "I WOULD LOVE TO GO UP TO 150 AND FIGHT SERGIO MARTINEZ"
"It's funny. None of these so-called pound-for-pound guys want to call me out. The same thing happened with Marquez. 'I don't know this guy.' 'Why should I fight him?' 'He doesn't have a name.' I was with him also on Showtime. I knocked out a guy, number one contender, in 56 seconds of the first round. It was the fastest featherweight title knockout in history, but he doesn't know who I am either. Saying they don't know me is just the fastest way to sidestep somebody and not get in the ring with him. It's a way to not have to deal with a fighter like me. I have that style that can give anybody problems...Marquez, Pacquiao, whomever I can get that would be the next biggest fight for my fans. I'm one of those throwback fighters that likes to fight the best because I want to be the best. I would love to go up to 150 and fight Sergio Martinez. Nobody wants to fight him either. I might just have to go past Mayweather and challenge a bigger guy to pick a fight," stated three-division world champion Robert Guerrer, who's eager to step in the ring and test his skills against any of the top fighters in the world. Check out what he had to say about Floyd Mayweather, Manny Pacquiao, Juan Manuel Marquez, Sergio Martinez and much more. MJ: Robert, recently Floyd Mayweather said he doesn't know who you are. What are your comments to that? RG: It makes me laugh when I hear that. I've been on co-features with Floyd Mayweather; he knows who I am. I've been at press conferences and weigh-ins with him. If anybody believes that, I have the Golden Gate Bridge for sale if anybody wants to buy it. It's funny to hear he doesn't know me. MJ: I've heard Floyd say that about people before, so it doesn't shock me. I don't know what's going to happen with his next fight. First you hear it might be Pacquiao, then you hear it might be someone else. What do you think the chances are that he fights Pacquiao next? RG: I don't think there's a chance. I don't see it happening until next year, if it ever does happen. MJ: It'll also be interesting to see what happens with Cotto as a free agent. Everything is so fluid in boxing right now. I know that has to keep you in suspense. What are you doing in the meantime while you wait out all of this? How do you handle it? RG: I'm always in the gym, staying in shape. I'm just waiting it out to see what happens. When I hear stuff like Floyd doesn't know me, I just laugh it off. You just have to laugh about it. MJ: Are you going to make a special appearance in Vegas some time in the future so he knows who you are? RG: The next fight out there in Vegas, I'll be out there for sure. Maybe I'll run into him. One thing I do commend Floyd Mayweather for is that he made a $100,000 donation to the cure for breast cancer. When somebody does that, it really hits home because of what my wife has gone through. I really take my hat off to him for that. MJ: How do you respond when some people say, "Why should Guerrero get a chance at Floyd when he hasn't fought anybody big at 140 or 147?" RG: You have to look at where a guy is fighting at fight night. Does he come into the ring in his natural weight class? I fight around 151-152 pounds on fight night. Floyd fights around 151-152 pounds on fight night. The only difference is I can get it down more than Floyd does. At my natural weight, I'll be 100% stronger than I usually am. I'll be 100% hydrated and 100% healthy. It'll be more devastating to the guy I fight. MJ: We also haven't seen much of anyone in those weight classes calling you out. RG: It's funny. None of these so-called pound-for-pound guys want to call me out. The same thing happened with Marquez. "I don't know this guy." "Why should I fight him?" "He doesn't have a name." I was with him also on Showtime. I knocked out a guy, number one contender, in 56 seconds of the first round. It was the fastest featherweight title knockout in history, but he doesn't know who I am either. Saying they don't know me is just the fastest way to sidestep somebody and not get in the ring with him. It's a way to not have to deal with a fighter like me. I have that style that can give anybody problems. MJ: If you can't get Floyd, who would be your top three choices for a fight to get you in line for Floyd? RG: Marquez, Pacquiao, whomever I can get that would be the next biggest fight for my fans. I'm one of those throwback fighters that likes to fight the best because I want to be the best. I would love to go up to 150 and fight Sergio Martinez. Nobody wants to fight him either. I might just have to go past Mayweather and challenge a bigger guy to pick a fight. MJ: So let me get this straight, you would fight Sergio Martinez at 150 pounds? RG: Oh yeah! Definitely. Like I said, I want to fight the best. If you can fight, you can fight. The more I go up, the better I am and stronger I am. It's about making big fights; the fans deserve big fights. There are a lot of characters out there ducking and sidestepping. Let's get down to business and start making these fights. If you can't get the best fight, you look for the next best one. MJ: Is there any chance you'll try to get to a mandatory position at 140 or 147 if you can't get the names you just mentioned? RG: Yeah, like I said, I'm just looking for the next biggest fight out there, whoever it is. MJ: It seems like Marquez or Morales would be a good one if available. RG: Oh yeah. I've been trying to get Marquez in the ring for quite a while already. We'll see what happens. MJ: Is there anything else you'd like to tell your fans at FightHype? RG: Yeah, to hear Floyd Mayweather say that he doesn't know me makes me laugh. You have experts saying it's a pick 'em fight. There are guys like Eddie Mustafa Muhammad and Kenny Adams saying I have the skill set to make a tremendous fight and compete with Floyd. There are some of the best trainers in boxing history talking about me that I have the skill set to mix it up with Floyd. It's time to make that fight. Man up and do it! I'm just training and doing my thing, but if Manny doesn't make that fight, Floyd, I'm ready to go. MJ: It would make sense for Floyd to fight another southpaw if he plans to fight Manny in the fall. RG: Let me tell you something, if he gets in the ring, as soon as I hit him, he'll know who I am.